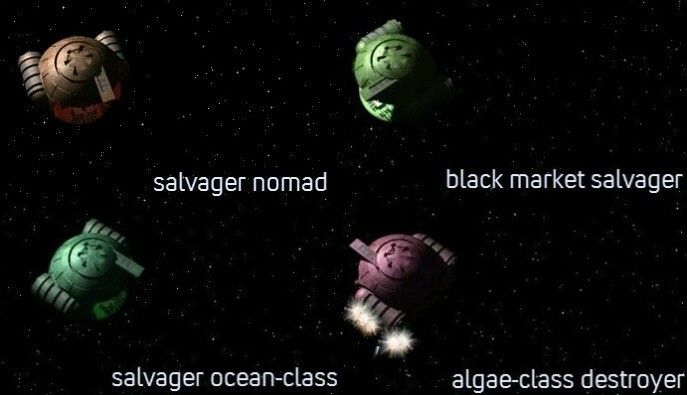 Not sure where to put this under: includes the Black Market Salvagers from before (the old, two different xmls are finally condensed into one), two new enemy Salvagers, one for the early systems and one nasty one for later, new friendly dockable traders, a new Ocean-class Playership, and a few new unique weapons (for the hostiles). As always, feedback is appreciated, and Enjoy! Re-uploaded at 42 downloads. Includes the fix found by ThePrivateer, as well as a wpn posRadius fix for the Algae-class (from 60 to 50, so the cannons aren't firing from outside the hull :oops:).